» New Jersey: Welcome Home Adam Rosemeyer Warriors' Watch Riders: WE HAVE YOUR BACKS AT HOME! 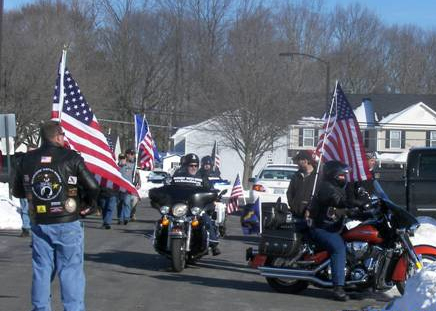 WHAT A GREAT welcome home for our Hero SSGT Adam Rosemeyer! Adam returned two weeks ago from his second deployment, this one in the UAE. 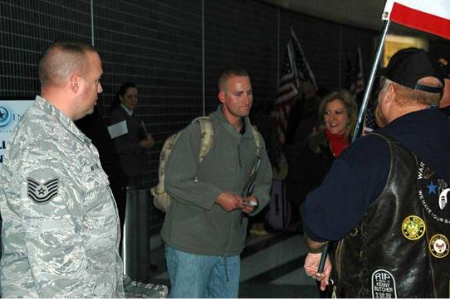 Adam’s awesome wife Sara contacted us before his return and asked us to let him know how much we appreciated his sacrifice with a good old Mug –n- Hug when he arrived at the PAX terminal on McGuire AFB and we were ready. But there were some surprises waiting for us! Sara hurt her Achilles tendon and with Noah 6 and Layla 2 at home Adam was able to get on a plane ahead of his unit to get home and help Sara. Adam came through terminal A at the same time we were waiting for a wounded warrior. We didn’t know it was Adam but happened to present him with a coin at the end of the flag line where his ride was waiting. We were still planning the Mug –N- Hug for Adam when Sara said a group gave him a coin at the airport and wondered if we knew anything about it. He was online looking up The Warriors Watch and checking if there was a picture of his return out there. Well here it is Adam! The surprises weren’t over. On our first attempt to rally for the Welcome Home there was so much snow Sara asked us to postpone and all but one of us did. One cage rallied, thank you Lee! Finally we got it together! 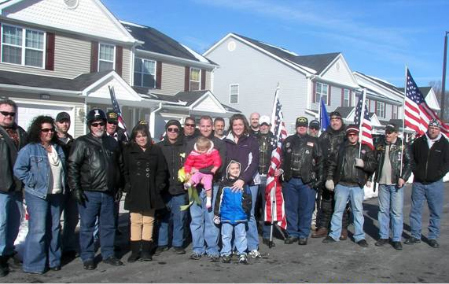 We rallied four bikes and nine cages with Warriors Watch, The Yellow Ribbon Club, A Hero’s Welcome, and Riders of the Lamb and rolled out to surprise Adam at his home. With a knock at the door while engines were revving and horns were sounding Adam jump up to see what the commotion was. We had to send him back in for shoes and a jacket as you can see it was a little chilly! We knocked Adam out with the HUGE Welcome Home he deserved! We also honored Sara for her sacrifice and hard work keeping the home front running while Adam was away. Our presentation was stopped only for a moment when Noah, 6, announced “Just one more thing, he is not going away again”. It was an honor to meet you and your wonderful family Adam. Thank You for your service and WELCOME HOME! No user commented in " New Jersey: Welcome Home Adam Rosemeyer "